Lina Iris Viktor, Materia Prima II (2017–18). Courtesy of Mariane Ibrahim Gallery, Seattle. “Usually I am more about trying to bridge divides of thought where people think things are in very defined spaces,” artist Lina Iris Viktor tells Harper’s Bazaar Arabia from her studio in New York. “I am all about making bridges.” The painter and conceptual artist is preparing new work for her first solo museum exhibition now open at the New Orleans Museum of Art entitled Lina Iris Viktor: A Haven. A Hell. A Dream Deferred. Known for large-scale black and gold works on paper and canvas, the sculptural surfaces of Viktor’s pieces shimmer opulently with densely patterned iconography. There is something searingly original and contemporary about her almost cosmic composition of hieroglyphic elements that recall myriad forms, from Aboriginal Dreamtime paintings to West African textiles. Building on her education in London, one that included studies in theater and performance, with early acting and singing classes, Viktor came to New York to study film at Sarah Lawrence College while acquiring a background in photography and design from the School of Visual Arts. As a result, Viktor has developed a unique, multidisciplinary practice. The results are breathtaking. Each piece is a painstaking, undertaking involving many meticulously planned stages, with a large-scale piece taking approximately three months to complete. For her unflinching figurative pieces, Viktor selects her costume, applies makeup and them photographs herself. The result is that the artist’s image then forms the foundation for the construction of the work. Lina Iris Viktor: A Haven. A Hell. A Dream Deferred. will close at NOMA New Orleans Museum of Art on January 6, 2019. 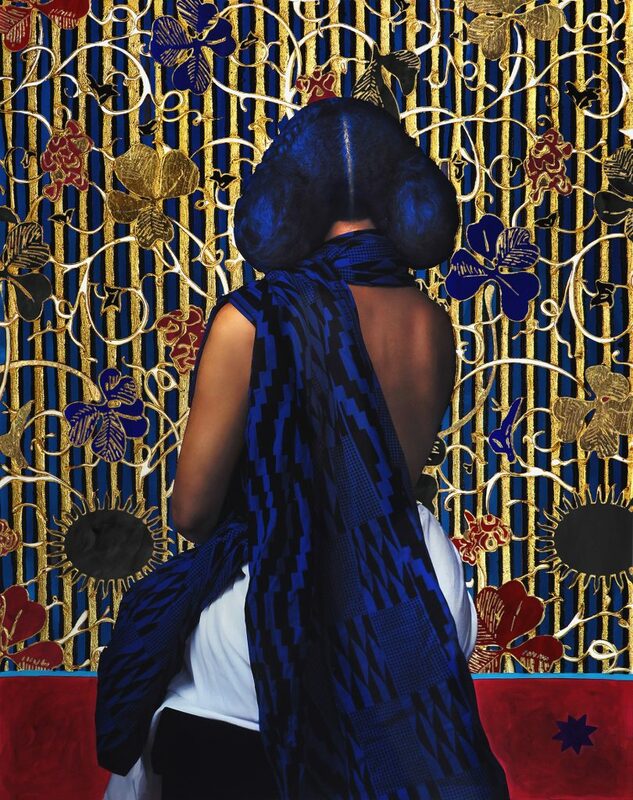 Neww York-based, liberian-British artist Lina Iris Viktor. Work in progress from the series A Haven. A Hell. A Dream Deferred. 2017-18. 24-carat gold, acrylic print on paper. 132x101cm. Second 2018. Lina Iris Viktor. Pure 24-karat gold, acrylic, gouache, ink, print on cotton rag paper. 52 x 40 in.